Submission #17 comes all the way from Australia! 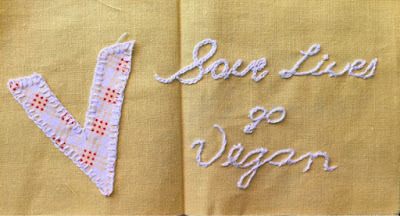 Made by Janis L., the banner reads, "save lives, go vegan." 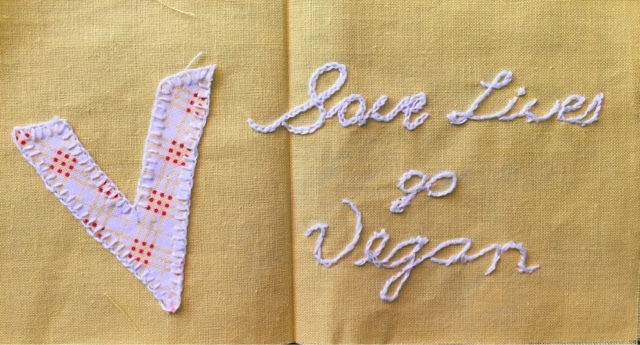 Janis chose to take part in The Vegan Craftivist Project because, she wanted "to do something to help stop animal cruelty and slaughter." Janis is vegan because she is "against animal abuse, cruelty, exploitation, suffering, and slaughter. It makes my heart ache."